I had to postpone last week’s installment of our Into the Void campaign. Had a family funeral to attend over in Louisiana. I got some cool spaceship miniatures to paint a couple of weeks ago. Waiting on some good stands/bases for them before I paint. Need to be able to properly manipulate them. 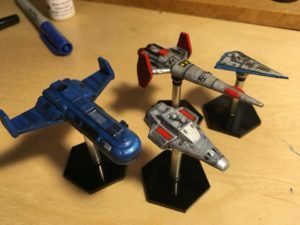 I haven’t painted a miniature since about 1993. Are my hands still steady enough? We – shall – see. Anyway, I have a couple of weeks to prepare for the next Traveller session. Going to try to wrap up the current story arc. But no guarantees. So we’ve had two play sessions of Classic Traveller in the Into the Void campaign. Both have gone well. I feel like the system is working as it should, even though I’ve had to guess on a few rules since I couldn’t find them on the fly. Honestly, the rule books are so short, and so simple, I need to sit down and really read every single word in them again. Today I answered one of my own questions simply by reading! Imagine that! Turns out all PCs have a skill level of 0 in every weapon. So yeah, your character with some other gun skill, like auto pistol-1, can pick up a shotgun and use it with no proficiency penalty. I’m sure there are a lot of other things I’m missing. The campaign is starting to really take shape now. I have a few goals to accomplish before the next session. 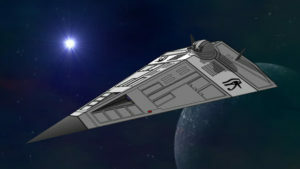 I need to spend a bit of time looking for good images of ships and common weapons to give the campaign more atmosphere and flavor. How is a tech level 13 auto pistol different from a modern day 9mm? I don’t know, because I’m not a gun guy, but I do know it should look really cool. Likewise, some nice images from the interwebs to illustrate the environments and places the PCs find themselves in would be good. One issue with these kinds of games, at least for me, is that they are so open-ended that sometimes it seeks like the PCs don’t have clear goals or motivations. In a fantasy game, that never seems like an issue. Kill monsters, take their stuff. Right? In this campaign, as well as CyberTex, I want a more interesting story than that. Once I get my players to write up some brief character backgrounds I think we can make things a bit more personal. And then, of course, they can kill some monsters. I also have some game mechanics topics I want to research in the old Journal of the Travellers Aid Society and other resources, like Freelance Traveller and the Zhodani Base. For example, I want to find some “minor” skills that are not included in the rulebooks, like language skills and a few other things. The trick will be adding things in that enhance the the game without blowing it up. And of course I now need to do a better writeup of the Robot. The PCs, archaeologist Zal Twist, and Fardt the Gluck cautiously enter the ziggurat. As they enter, the giant columns inside slowly begin to glow, illuminating the inside of the huge structure. While it is big, the inside is very simple. Zal deduces that it is a place of worship. Of what? No telling. Hieroglyphs carved into the massive walls depict star systems. Roger attempts but fails to use Navigation skill to recognize the formations. Zal believes they are probably unknown systems of the Precursors’ past. As they proceed into what is apparently a temple, Roger helps Zal to photograph and catalog the glyphs for future analysis. Lucky and Barney continue to explore the temple and discover a dusty but apparently undamaged robot. They examine the robot, determining that it is of fairly common manufacture. Not a precursor artifact. They drive the air raft into the building, and use its system to recharge the robot. While they do that, Fardt had been fiddling with a stone control panel on top of a slightly raised section of floor. Slapping a hand on top, he activates the section — an elevator. A door in the ceiling opens, and he disappears into it as the elevator reaches that level. Lucky and Barney manage to reactivate the robot, which speaks galactic common. It is apparently a survey robot, sent to this temple some 450 years before, by an unknown source. It ran out of power while waiting for it’s party to arrive. Learning that 450 years have passed, it agrees to complete its survey mission by joining the PCs crew. The party, including the robot, take the elevator to the upper level, and discover an astronomical observatory and data center. The walls are still carved with similar glyphs. A huge glass sphere occupies the middle of the room. The PCs discover what they surmise to be data storage media — polyhedral objects arranged in sequence. Zal makes his archaeology roll, and figures out the newest one. 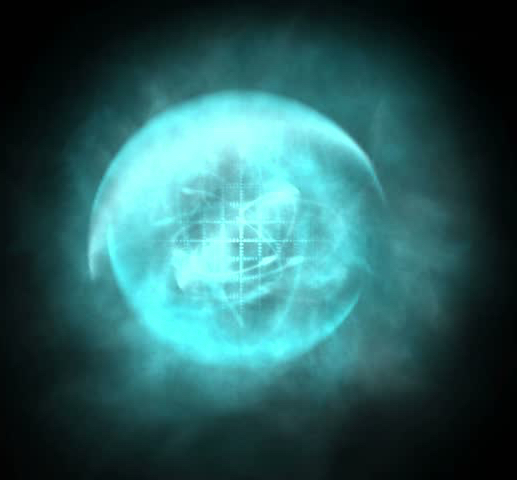 They put it in a player and activate it, as the glass sphere lights up with a hologram of star charts. Manipulating the data unit, the image changes to diagrams of what look like living cells, separated by space, with beams of light flickering between them. Further tinkering brings into view a star chart/hologram of the galaxy from a very wide view. The PCs are able to see the Great Nebula of the Void in one place. Some distance from it, a glowing dotted line and arrow hang in space — pointed toward the Great Nebula. A trajectory? Who knows? Zal wants to take that data unit back to the ship, where he has gear to analyze it. They load everyone, including the robot, into the air raft and take off back for the ship. As they approach the landing site, Barney rolls and the party gains surprise on the scumbags from the tavern back on Mylor. The ones who told Zal about this planet. From the edge of the woods, they use binoculars and see that the scumbags have a bunch of the natives held captive, and few are dead. Not good dudes. They see that the scumbags have come down in a landing craft, suggesting a larger ship in orbit. The PCS come up with a plan. They’ll used the element of surprise to do a high speed drive-by of the bad guys, taking out as many as possible. Clearly, they are not there to be nice. I have them roll for 1-3 rounds before they are in close range. They roll 1. They manage to come out of the forest quietly, then roar toward the bad dudes. They exchange gunfire. The robot shoots electrical bolts. One bad guy hit. It’s Croyd, their leader. He’s hit bad enough to be rendered unconscious. Roger is hit, but his ballistic jacket keeps him from taking damage (shot “misses” due to jacket). Round 2 – Roger, Barney, and Fardt (who is borrowing a shotgun) all fire. 2 more goons go down – Iron Balls McGinty and Tommy the Gimp. Lucky is driving, and runs right over the serpentoid henchman, Glych. The bad guys are all alive, but out. They tie ’em up. The natives lavish praise on the PCs for saving them. Iron Balls regains consciousness. Displaying no loyalty to his colleagues, Iron Balls offers to give the PCs info on the ship in orbit, to help them get past it. He says if they don’t check in by tomorrow, the pilot will probably come in and blast their ship from the air. He wants to be a temporary member of their crew, and be promised safe passage back to Mylor. They agree. End of session. Players are already devising their next moves for leaving the planet without getting shot up by a potentially larger ship. Elapsed game time: 12 days. This session was dedicated to Eric Manuel, a friend from years past, who died recently from cancer. Smooth sailing old friend. This was the first game of my classic Traveller campaign. Been trying to get this started for some time, and today was the day. We decided that our gaming group would do these games in short, 2-3 hour sessions, to make it easier for everyone to get together and easier for me, the Ref, to prepare. Into the Void takes place in the frontier area of known space, on the very outskirts of an Imperium vaguely similar that of the standard Classic Traveller universe. Space beyond the frontier border is known as “the Void.” I’m using the same organizations, but ignoring the history of and maps of that universe. 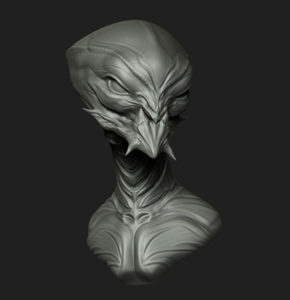 Making my own alien races, etc. Game one begins with the recently retired members of the Imperial Scout Service. They begin on planet Mylor, on the very edge of the Void, in an as-yet unnamed and incompletely explored subsector. Most of the subsector is in the Void. A small world with standard atmosphere, Class B space port (no “high-port”), and one major city of about 12,000 sophonts. The ex-Scouts, Roger (the pilot), Fred (“Lucky” – due to his many missed survival rolls and maimings), and Barney (expert ship Engineer) are in the star port tavern, trying to decide what to do next. Roger had mustered out with a Scout ship, and the three have decided to seek their fortunes together. While at the bar, a local Gluck tries to pick Roger’s pocket. Roger smacks the creature away, but doesn’t pay him much mind afterward. Glucks are a common species in this part of the Galaxy. Spheroid beings, with no obvious facial features, they have 6 arm/legs spaced evenly around their bodies. They move by kind of roll/walking. They can understand human speech, and communicate in Galactic Common by vibrating organs in their breathing orifices. While quite alien looking, they are psychologically and intellectually very much like humans, and thus integrate well into human culture. Anyway, the pickpocket Gluck backs up. The slight altercation gets the attention of table of young marines, on their way back to the inner-Imperium after long duty on the frontier. The Marines taunt the Scouts, who react by buying a round of drinks for them, avoiding trouble. After the Scouts have been at their table for a bit, a tall, thin old human approaches their table and asks if he might join them. He introduces himself as Zall Twist, an exo-archaeologist from the university on planet Zapata, one sector rimward – the subsector capital of the Zapata subsector. He’s been in the frontier for several weeks, researching rumors of the Precursor civilization, the theorized interstellar society predating the Imperium by several million years. This is his area of specialization and main research interest. He’s met a group of merchants (he points them out in the tavern) who mentioned to him an interesting ruin they happened upon 2 parsecs into the Void, when their ship misjumped. They landed on the moon of a gas giant for repairs and refueling, and while in the air they spotted what looked like a tremendous ziggurat in the middle of the heavily forested equatorial region. Zall thinks this may indeed by related to the Precursor culture, and wishes to travel to that world in the Void to investigate. He asks if the PCs have a ship, and upon finding that they do, offers them 50K up front, and 50K upon completion and return to Mylor, if they will take him to that gas giant’s moon and mount an expedition with him. He says he can think of no better companions on such a voyage than three very able former Scouts. The PCs agree to Zall’s terms, and agree to leave the next day. They spend the rest of the day buying gear and supplies for this, and future, missions. The next morning they meet Zall at the Scout base, where their ship is landed. It’s been refueled and maintenance is done. Zall has some scientific gear to load. As they load the ship, Roger feels a gut on his pants leg. It’s the gluck from the Tavern, who introduces himself as “Fardt” — with a “D”. He thanks Roger for not beating him up in the tavern — that it was nothing personal, and asks if the crew needs a cook. Feeling sorry for Fardt, the crew hires him on for 100cr a week, and finds space in the cargo bay to make him a comfortable quarters. The ship lifts off, travels several hours to 100 planetary diameters distance, and engages the jump drive. Roger rolls and the ship avoids mis-jump. They enter jump space uneventfully. During the week in jump space they have a chance to get to know Zall and Fardt. They get a few more details about Zall’s mission plan (not much of a plan, as they are going into the unknown), and learn that Fardt is a good guy — a reasonable and generally good natured rogue. The ship exits jump space on target, 100 pds from the gas giant. They immediately spend the first day in-system skimming the gas giant for fuel, in case a fast getaway is needed later. They then begin scanning the surface of the moon for the ziggurat. They quickly find that the gas giant is emitting random bursts of radiation into space. Remaining in orbit for an extended period is a bad idea. For each hour spend looking for the ziggurat in orbit they have a 2/6 chance of finding it, but a 1/6 chance of being affected by a radiation burst. In the first hour they do not find it AND they get hit by a minor burst. No structural damage to the ship, but some scalding of hull plating that will need to be replaced. In the second hour they locate the ziggurat and avoid further radiation bursts. They land in a clearing of the dense forest, 1/4 kilometer from the ziggurat. Upon landing, they spend the first day doing ship maintenance, again preparing for fast exits if needed — a lesson learned during their 16 years as Scouts. Barney, the engineer, successfully maintains the J and M drives, finding no damage from the radiation burst. The night sky of this moon is dominated the gas giant and the spectacle of occasional radiation bursts harmlessly lighting up the night sky and the distant Great Nebula of the Void, visible as a red haze in the sky, even from several parsecs away. Day two they decide to take the air raft to the ziggurat. The entire group goes, including Fardt. They take the air raft high above the trees, surveying the area around the ziggurat from the air. This close, they see what appear to be old landing pads to one side of the structure, overgrown now with vegetation. On the other side, the ruined walls of smaller structures. They land near what appears to be a big stone door on the base of the structure. Looking at the ruined building around them, they use their IR googles to scan the surrounding forest. They can see the heat signatures of small humanoid shapes out in the relative darkness of the woods. The shapes are not closing in. Just watching. Clearing the heavy vine growth from the wall around the massive stone door, they discover a still-active electronic pad with a couple of blinking lights. They assume this is the doorbell or door actuator. Lucky used his Electronics-2 skill and manages to hotwire the system. The huge door slowly rises as the party stands at the entrance, the woods full of humanoids of undetermined friendliness, and the ziggurat itself inviting them inside to discover who-knows-what. End of session 1. Game time elapsed 11 days. I may have gotten a few details about time required for gas giant skimming and stuff like that wrong. I’ll look that stuff up before the next session. Since it was not critical to the game today I just assumed a day for stuff like that. I have a better idea how my group will play Traveller now, so I can tweek the upcoming stuff in this particular adventure, and make sure everyone has a chance to shine, and make sure there’s some exciting stuff in game 2. I could have really played up the radiation burst a lot more — the effects on the ship, a chance for the engineer to do this thing, etc. Live and learn. That would have been exciting though. Lesson learned. Now that I have the three core books, a bunch of supplements (all from eBay), and a CD-ROM that contains everything they ever published for Classic Traveller, I thought I’d start working up some campaign materials. At this point, I’ve decided to use the Spinward Marches supplement at the overall setting for the game. 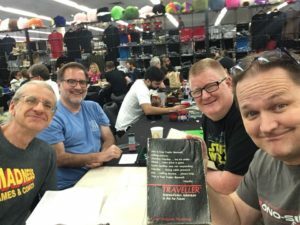 I purchased some inexpensive Traveller game scenarios written by Michael Brown to give me some ideas, and decided to use one of them as the core of Game 1. I’m about 75% done with writing for this session. I have no idea how this will go. There are a number of reasons. First, well, it’s a big galaxy. Not totally sure I am good enough at GMing to handle it. But we haven’t even rolled up the PCs yet, so once we do that and have some backstories for them I should be able to come up with some additional material for the game. Also – how will my players react to the game? One of the things I like about CT is the very simple and efficient character stats. There’s not that much there to keep track of. A line of six numbers/letters describes the characteristics. A few very general skills with a number next to them describe that character’s professional skills. The game pays no attention to things like languages spoken, etc. There will no doubt be some areas where I have to use my Referee Power to just say “OK, you speak Aslan” or whatever. That’s fine, but let’s face it, GURPS details everything your character can do, so this is way different. And of course, there is pretty much no character progression system. PCs are generated as experienced characters. The first time I tried to ref a Traveller game here’s how it went (I was in highschool). The PCs were hired by some colonists to come and kill a massive beast that was terrorizing them on a remote planet. The PCs rented a helicopter gunship, took it to the planet, and killed the monster from the air. Game over. Yeah – good thinking on their part, not so good on mine, and not all that much fun. Hopefully as a 52 year old man who thinks a bit more clearly about these things, I can make Game 1 of this new campaign will be more engaging. There are some other issues to deal with as well. Classic Traveller was created in the late 1970s. There are lots of technological developments and ideas it simply doesn’t account for that well. Computers, for one. There’s just a lot of stuff that those little black books, despite their elegance, don’t really address. If I were a true “rules lite” kind of guy that wouldn’t bother me, but I’m not. I like a little more detail in the system, but there are lots of resources to use beyond the LBB, so I think it’s cool. I’ve noticed this same kind of issue with my Cyberpunk campaign. Older science fiction – pretty much anything pre-internet – simply doesn’t account much for networked computing, mobile devices, the development of nanotechnology, etc. I am fine with simply saying that stuff doesn’t exist. We’re playing Traveller as if we were living in 1977, as if we were in the novels of that era. The nice thing about this is that I can try my hand at a space campaign without spending lots of time creating detailed character sheets for NPCs. It’s great being able to pick up the Citizens of the Imperium supplement, saying ” I need a scientist”, and finding plenty of easy to use stats right there. I have to admit though that if the players end up enjoying this I may convert to GURPS so their characters can progress a bit during the campaign.